Like processors, RAM modules are extremely sensitive to static charges and should be handled very carefully. Never touch the metal conductors of a memory module, and only handle RAM modules by their edges. Nothing feels quite as bad as destroying a perfectly good stick of RAM. You can learn more about anti-static precautions here. Before actually installing the RAM modules in your computer, check again to make sure that the RAM you have is of the correct type and speed for your motherboard. Most computers at the time of this revision use DDR-4 memory modules, but double-check to make sure. There should be a label on the RAM that will have its speed, type, and size printed on it. If using a dual-channel memory configuration, make sure that the RAM in both slots of the bank match each other. I like to use identical RAM sticks (same size, same speed, same manufacturer), especially in dual-channel configurations. 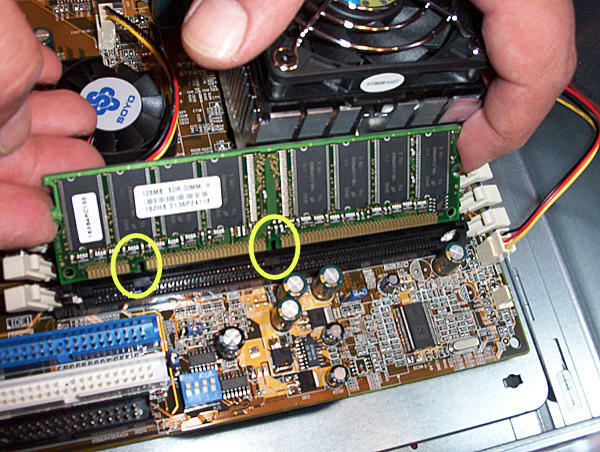 RAM modules are keyed with little notches that fit over corresponding tabs in the RAM slots. I've circled them in this picture. Before inserting the RAM module, make sure that the notches and tabs are correctly lined up. If there are more notches than there are tabs (or vice-versa), then you have the wrong RAM for your motherboard. The same thing applies if the notches and tabs don't match up. 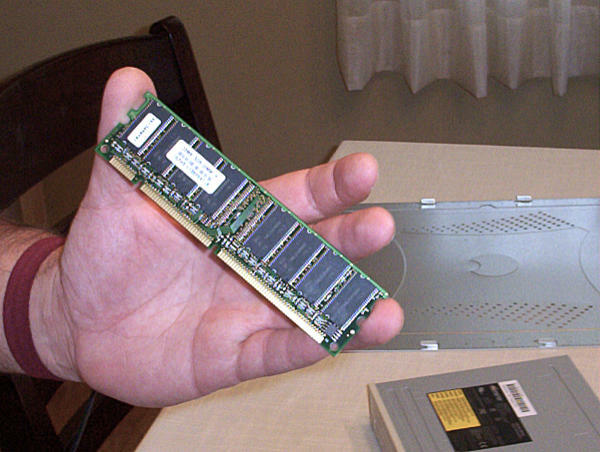 You either have the wrong RAM, or you're holding it in the wrong direction. Try flipping it around. If the notches and tabs still don't match up, then it's the wrong RAM, and all the force in the world won't make it fit. Once you're sure you have the right RAM, to actually insert it, simply push it firmly, straight down into the slot, and push the retainer clips inward. That's it. If you are using SDRAM or single-channel DDR-SDRAM, then it usually doesn't matter which modules go into which slots. But a few motherboards require that you start with the first slot and fill them in order, so you may as well do it that way. If you are using DDR memory in dual-channel configuration, however, then you must fill the first slot of each of the two RAM banks with an identical stick of RAM; and you must do the same with the second slots of each bank, if you are using them. The RAM sticks in each bank must be identical to each other. In addition, although it is not required, I recommend that the two banks also be identical (same speed, same size, same manufacturer, same model). In other words, a motherboard that supports dual-channel DDR will usually have two (or more) RAM banks, each of which will have two slots. The banks are usually identified by different color slots. So you may have, for example, four slots, two of which are black and two of which are blue. The black slots would be one bank, and the blue slots would be the other bank. Each bank of RAM must have the same size and speed of RAM in both slots in a dual-channel configuration. If the RAM modules are not identical, the system either will default to single channel or it won't work at all, depending on the motherboard and the memory architecture. In theory, it shouldn't matter if the RAM modules installed in a computer are made by different manufacturers, as long as the type and speed are the same. There are standards for this sort of things, so memory from different manufacturers should be compatible. But sometimes subtle differences between manufacturers can cause problems. I always use RAM made by the same manufacturer and of the same model whenever possible. Also in theory, when different speed RAM modules are used, all of the RAM should clock to the speed of the slowest module. But in reality, I've found that mixing RAM speeds sometimes causes system instability. I've had plenty of cases where RAM sticks that tested just fine alone wouldn't play well together. So I strongly recommend that all of the RAM installed in your computer be of the same speed. In fact, in practice, I just use all identical sticks in any given computer. I've even removed perfectly good RAM when doing an upgrade, just so all the sticks in the machine would be identical. My favorite RAM manufacturers are, in no particular order, Corsair, Crucial, G.Skill, and Kingston. I've never had any problems with RAM from any of those manufacturers. But there are many other companies that make good RAM. Now that you've installed your computer's RAM, let's move on to the next step: Installing Expansion Cards.